Contemporary Docklands is the product of an ongoing urban renewal project to extend the area of the Melbourne CBD (excluding Southbank and St Kilda Road) by over a third when completed around 2015. It is now home to several of Melbourne's modern landmarks, including Docklands Stadium and the Melbourne Star Observation wheel. From the 1880s, the former swamp west of Melbourne became heavily used as a dock, with an extensive network of wharfs, heavy rail infrastructure and light industry. However, following the containerisation of shipping traffic it fell into disuse and by the 1990s was virtually abandoned, becoming notable for an underground rave dance scene, a dance culture which survives through popular organised events held at Docklands Stadium. Docklands Stadium began construction in 1997 as a centrepiece to kick-start developer interest in Docklands as a viable renewal area. Urban renewal began in earnest 2000, with several independent privately developed areas overseen by VicUrban, an agency of the State government of Victoria. The brief for the master plan was for wide open water promenades and road boulevards with contributions of landscaping and public art commissions to be made by each developer and construction was to adhere to strict milestones. VicUrban promotes its vision of Docklands as being a major tourist attraction and projected over 20 million visitors a year and a future (2015) residential population of over 20,000. A handful of significant buildings were retained as part of the development, generally due to their association with the area's industrial and maritime history. Most of these heritage buildings are intended for adaptive reuse and integration with new facilities. Docklands has become a sought-after business address, attracting the national headquarters of the National Australia Bank, ANZ, Medibank, Bureau of Meteorology, Myer, National Foods as well as the regional headquarters for Ericsson and Bendigo Bank. The business park model of medium-rise office buildings combined with transport and proximity to the City Centre is seen by many in the real estate industry to be one of the reasons behind the success of the Docklands office market. Although still incomplete, Docklands developer-centric planning has been received significant criticism and many Melbourne politicians and media commentators lament its lack of green open space, pedestrian activity, transport links and culture. 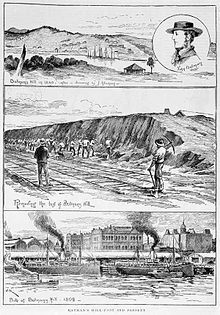 Before the foundation of Melbourne, Docklands was a wetlands area consisting of a large salt lake and a giant swamp (known as West Melbourne Swamp) at the mouth of the Moonee Ponds Creek. It was one of the open hunting grounds of the Wurundjeri people, who created middens around the edges of the lake. At Melbourne's foundation, John Batman set up his home on Batman's Hill at Docklands, marking the westernmost point of the settlement. However, the rest of the area remained largely unused for decades. The advent of rail infrastructure in the late 1860s saw the City's industry gradually expand into the area. The earliest extensive plans to develop the area was in the 1870s, when a plan was prepared to extend the Hoddle Grid westward, following the curve of the Yarra River and effectively doubling its size. The plan proposed several gridlike blocks with an ornamental public garden and lake in the shape of the United Kingdom, occupying the site of the salt lake. However, expansion of the grid westward was abandoned in favour of a northward extension. Under the guidance of British civil engineer John Coode, a major engineering project began in the 1880s to reroute the course of the Yarra River, which resulted in the widening of the river for shipping and the creation of a new Victoria Dock (the name was previously used by one at Queens Bridge as early as the 1850s). The dock was lined with wharves and light industry grew around the nearby western rail yards of Spencer Street railway station (now Southern Cross railway station), which were used for freighting the goods inland. During the wars, Victoria Dock was used as the main port for naval vessels and most of the Victorian troops returned from both wars to the docks. By the 1920s, with shipping moved from the Yarra turning basin at Queensbridge, Victoria Dock and surrounding port had become Melbourne's busiest. With the introduction of containerisation of Victoria's shipping industry in the 1950s and 1960s, the docks along the Yarra River, east of the modern Bolte Bridge, and within Victoria Harbour immediately to the west of the Central Business District, became inadequate for the new container ships. The creation of Appleton Dock and Swanson Dock in an area west of the Moonee Ponds Creek, now known as West Melbourne, closer to the mouth of the Yarra, became the focus of container shipping, effectively rendering redundant a vast amount of vacant inner-city land to the immediate west of Melbourne's CBD. Docklands was seen as a large urban blight by the Cain State Government. Property consultants JLW Advisory carried out the first market demand assessment of the site. The size of the Melbourne Docklands area meant that political influences were inescapable. The Docklands project was on top of the government's agenda, however, due to the poor condition of the wharf infrastructure, a further investment was required to initiate the project, which the government at the time could not afford. Nevertheless, the Docklands project stayed on the drawing board, but with little progress. In 1989, several architectural firms were invited to discuss how the area could best serve the Melbourne public. In 1990, the Docklands Task Force was established to devise an infrastructure strategy and conduct the public consultation process. The Committee For Melbourne, a not for profit organisation that brought together the private sector of Melbourne for a public good, was pursuing another planning strategy. It involved a bid for the Olympic Games and another proposal to turn the Docklands into a technology city, known as the Multifunction Polis (MFP). Both bids fell through in late 1990. Nevertheless, the Committee For Melbourne's approach became the preferred model in the proceeding strategies for the Docklands development, leading to the formation of the Docklands Authority in July 1991. With a government running in budget deficits, not much progress was made on the Docklands project. In late 1992, Jeff Kennett was elected Premier. Kennett instituted many changes and turned the government's financial position around. He then embarked on a multitude of projects, which included Docklands. It was politically imperative to get the project rolling, the Docklands Authority opted for the concept of having leaving all design and funding of infrastructure to the developers. The development industry supported this, and claimed that the project would be more efficient. Docklands was divided into sections or precincts, which were to be tendered to private companies to be developed. May 1996 saw the relaunch of the tender process. Few restrictions were applied to the bids from developers, and as the vision was to make Docklands 'Melbourne's Millennium Mark', the key criterion for a successful bid was to get projects going by 2000. It did not take long for the realisation that the lack of government coordination in infrastructure planning would create problems. Developers would not invest into public infrastructure, where benefits would flow on to an adjacent property. This was corrected by allowing developers to negotiate for infrastructure funding with the government. The Docklands Village precinct was planned for a residential and commercial mixed development, but, in late 1996, that plan was scrapped when it was announced a private football stadium would be built on the site. The site was chosen for its easy access to the then Spencer Street Station (now Southern Cross Station), and it was intended to be an anchor for the entire project and provide for a clear signal to the long-awaited start of the Docklands project. However, this would create a huge barrier between the City and Docklands. In 1997, the Docklands commission engaged architects Ashton Raggatt McDougall to design the Docklands masterplan. With the exception of Yarra Waters (later Yarra's Edge) bid by Mirvac, bid for every other precinct between 1998-1999 fell through, reasons for which were often unclear due to secrecy provisions and a change of government. Docklands became notable during the 1990s for its underground rave dance scene. The growth of the warehouse rave scene carried on from the earlier gay and lesbian warehouse party scene which had started in the early 1980s, and continued in the Docklands through parties such as The ALSO Foundation's Red Raw, Winterdaze, New Year's Eve, and Resurrection dance parties. The site was also host to a number of dance parties by Future Entertainment and Hardware Corporation. DJs and performers such as Paul van Dyk, Carl Cox, Jeff Mills, Frankie Knuckles, David Morales, Marshall Jefferson and BT headlined these events. The biggest event hosted, in terms of attendance, was the "Welcome 2000" New Year's Eve dance party hosted on 31 December 1999. 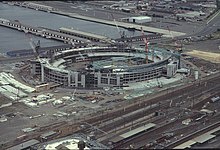 In 2000, a newly elected government of premier Steve Bracks released a new tender for Docklands Development, via Vic Urban (a rebranded Docklands Authority). Through the tendering process for the sites, the business park was split once more and awarded to two consortia, becoming Entertainment City (renamed Paramount Studios) - a movie theme park with film studios, to be developed by a Viacom led consortium, and Yarra Nova (which later evolved into NewQuay), to the MAB Corporation consortium. The Paramount Studios proposal fell through, and the site was put to tender once more, as Studio City, and later awarded as two parts, becoming what is now the Central City Studios and Waterfront City. Yarra Waters/Yarra Quays was awarded to Mirvac, later becoming Yarra's Edge. The technology park was renamed Commonwealth Technology Port (or Comtech Port) before finally becoming Digital Harbour. A number of other sites also encountered false starts, with Victoria Harbour originally being awarded to Walker Corporation, before being put out to tender again and finally being awarded to Lendlease in April 2001. The Batman's Hill precinct was originally awarded to Grocon, which had plans for what would have been the world's tallest building rising 560 m, dubbed Grollo Tower and featuring a mix of office, apartment, hotel and retail. This deal also fell through with the site being subdivided into 15 parcels as well as No 2 Goods Shed. On 1 July 2007 Docklands became part of the City of Melbourne Local Government Authority, however, VicUrban retained planning authority until 2010. Significant heritage buildings include 67 Spencer Street, former railway offices (adaptively reused as the "Grand Hotel" apartments), the railway goods sheds (adaptively reused as an indoor market), The Mission to Seafarers building, Victoria Dock and Central Pier, Queens Warehouse (adaptively reused as a vintage car museum), Docklands Park gantry crane and a small number of warehouses and container sheds. The Batman's Hill precinct is bordered by the Yarra River to the south, Spencer Street to the east, Docklands Stadium to the north and Victoria Harbour to the west. The precinct is named after the historical landmark Batman's Hill, which was once located within the area. It is a mixed-use precinct including commercial and retail space, entertainment, hotels, residential sections, restaurants, cultural sites and educational institutions as well as the historic Rail Goods Shed No. 2, which was split in half to allow for the extension of Collins Street into Docklands, providing businesses with an address that is considered to be prestigious. The area is 100,000 square metres. More than half the precinct is already built, committed or under construction, and includes the Watergate/Site One apartment and small office complex, 700 Collins Street (home to the Bureau of Meteorology and Medibank), 750 Collins Street (the Melbourne headquarters of AMP), Kangan Institute's Automotive Centre for Excellence (ACE) and the Fox Classic Car Museum, 717 Bourke Street (consisting of a 294-room Travelodge Hotel) and 737 Bourke Street (home to National Foods). On 2 August 2007, it was reported that a $1.5 billion scheme had been earmarked for Collins Street by Middle Eastern investment company Sama Dubai, to be designed by architect Zaha Hadid and Melbourne firm Ashton Raggatt McDougall. The plan would consist of four buildings, including Docklands' tallest tower as well as civic spaces spanning two sites to be built on decking over Wurundjeri Way. The proposed tower will be between 50 and 60 storeys tall but did not proceed and VicUrban put the site back out to tender in early 2011. The offices of Fairfax Media are at 643 Collins Street. The new building, known as Media House, comprises 16,000 m2 of office space accommodating 1,400 staff, on decking over railway lines opposite Southern Cross Station. The $110 million eight-storey facility was designed by architects Bates Smart to achieve a 5-star Green Star rating, and will feature a news ticker, outdoor screen and grassy plaza. It was developed by Grocon in 2009. Collins Square (previously Village Docklands) is a 3ha precinct within the Batman's Hill precinct. It is being developed by Walker Corporation. Collins Square is the outcome of a split of precincts in the tender process in 2000, which resulted in Goods Shed South, 735 Collins Street and Sites 4a-4f, originally awarded to the Kuok Group and Walker Corporation. A masterplan prepared by Marchese + Partners in conjunction with Bligh Voller Nield architects was approved in early 2002. It included a 60-storey Shangri-La Hotels and Resorts tower with a Collins Street address and a mix of commercial and residential towers, as well as the refurbishment of the southern half of Goods Shed No. 2 into a night market and food hall. In mid-2007, a new masterplan was prepared by Bates Smart. In it a new 38 storey office tower replaced the Shangri La Hotel on Collins Street and the number of streets is reduced from four to three, replaced by pedestrian thoroughfares. Overall there will now be five office buildings, ranging in height from 155m (to roof) to 36m, a 10,000sqm retail and public space, and the refurbishment of the Goods Shed with a 'lantern' structure addressing Collins Street. The entire precinct is aiming for a 5 Star Green Star rating. Collins Square is currently under construction. The Stadium Precinct, which sits on the eastern edge of Docklands, consists of Docklands Stadium, Seven Network's Melbourne digital broadcasting centre, Victoria Point, Bendigo Bank offices and Quest serviced apartments. It is linked to Southern Cross station and the Melbourne CBD by the Bourke Street pedestrian bridge, built over railway lines. During the 2000 Docklands development tender process, the stadium precinct was divided into four corners, the North West Stadium Precinct (NWSP), North East Stadium Precinct (NESP), South East Stadium Precinct (SESP) and South West Stadium Precinct (SWSP). The NWSP was awarded to Channel 7/Pacific Holdings. The NESP was awarded to Pan Urban. The SWSP was awarded to Devine Limited/RIA Property Group and the SESP - Bourke Junction Consortium (ISPT, CBUS Property and EPC Partners). Docklands Stadium (originally Colonial Stadium) was opened in March 2000. The ability for the structure to have both open and closed roof configurations has seen it host many sports events, including Australian Rules Football, soccer, cricket and rugby as well as concerts. The stadium complex is currently managed by Stadium Operations Ltd, which is owned by the Seven Network, with ownership transferring to the Australian Football League in 2025. Developer Pan Urban has announced plans for a $300 million twin-tower apartment development, known as Lacrosse Docklands, for the NESP, with the towers set to rise 21 and 18 storeys respectively, above the stadium concourse, with restaurants and bars opening out on to the concourse, forming a retail plaza. Plans for the site to be known as Bourke Junction include office towers of 29 and 21 storeys on the north-eastern and south-western corners of the SESP site, as well as three lower-rise buildings housing a 250-room hotel, a pub, medical centre, retail facilities, a business club and a two-level gymnasium. Digital Harbour is a waterfront that has an area of 44,000 square metres, with development intended to expand to include 220,000 square metres of commercial, residential, SOHO units and retail space. At present[when?] only three buildings have been completed; 1010 LaTrobe Street/Port 1010 (home to VicTrack, Australian Customs and Border Protection Service), and the Innovation Building (home of the Telstra Learning Academy and Innovation Centre). A third building, Life.lab currently resides at 198 Harbour Esplanade, while a fourth, 1000 LaTrobe Street, is expected to commence shortly. Port 1010 received the Commercial Architecture Award at the 2007 Victorian Architecture Awards, held on Friday 13 July. The Digital Harbour Business Association was launched in 2011. This is a group of businesses established in the Digital Harbour precinct in the Docklands. The precinct is a destination for IT, Media and other related businesses. The aim of the association is to promote the businesses within Digital Harbour to the wider Docklands Community and the Melbourne CBD. The Victoria Harbour Precinct is the centrepiece of Docklands. The precinct includes a proposed extension of Collins Street and Bourke Street to meet at the water's edge. It has an area of 280,000 square metres, with 3.7 kilometres of waterfront. The 12-year construction plans for Victoria Harbour include residential apartments, commercial office space, retail space, community facilities and the development of public spaces such as Grand Plaza, Harbour Esplanade, Docklands Park and Central Pier. One of the first completed office buildings in the precinct was the colourful National Australia Bank (NAB) headquarters, located at 800 Bourke Street, which accommodates approximately 3,600 staff. The building has large open floor plates, an atria, a campus-style workplace and a four-star energy rating. The first residential tower to be built at Victoria Harbour was Dock 5. Rising 30 storeys, it was designed by award-winning Melbourne firm John Wardle Architects and HASSELL. Dock 5 derives its name from its location, which was known as Dock 5. The Gauge, at 825 Bourke Street, will house the new offices of developer Lend Lease and Fujitsu. The eight-storey building was designed to achieve a six-star energy rating, becoming the second building in Docklands to do so. A Safeway supermarket opened in Merchant Street (opposite The Gauge) in 2008, along with a number of other retail tenancies at street level, including Australia Post, a childcare centre, and offices above, which have been occupied by LUCRF Super and the National Union of Workers since 2008. 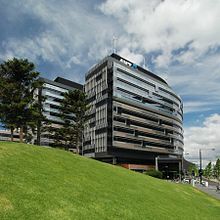 In 2009 the Australia and New Zealand Banking Group's (ANZ) new world headquarters at 833 Collins Street have was completed. The office complex includes shops, car parking facilities and a YMCA. It enables 6,500 ANZ staff to work in one integrated area. The new ANZ headquarters, designed by HASSELL and developed by Lend Lease, was expected to become the largest office complex in Australia. Construction commenced in late 2006. It has been designed to achieve a six-star energy rating. In 2007, Myer announced that it had chosen Victoria Harbour as the location for its new Corporate Store Support Offices. The new offices were built at 800 Collins Street, opposite ANZ. 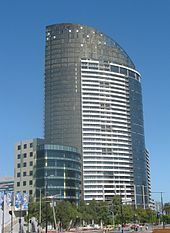 NewQuay, opened in 2002, was one of the first residential and commercial developments in Docklands. It currently has six residential towers and a podium building developed by the MAB Corporation. The flagship building, Palladio - which is shaped like the prow of a ship - is named after Italian architect Andrea Palladio. The podium building, Sant'Elia is named after another Italian architect, Antonio Sant'Elia. The rest are named after Australian artists: Nolan (Sidney Nolan), Arkley (Howard Arkley), Boyd (Arthur Boyd), and Conder (Charles Conder). In 2013, the construction of the twin residential towers "The Quays" was completed. Aquavista, completed in May 2007, is a strata office development and the first commercial building to be completed in NewQuay, as part of the HQ NewQuay development. Another, the seven-storey 370 Docklands Drive, is currently under construction, with a further two buildings - Lots 5 & 9 - currently under design development. On 17 October 2007, MAB Corporation launched 'The Avenues at NewQuay' development, consisting of three-storey townhouse residences, with park and waterfront frontages, to be built as part of NewQuay's western precinct. The development is being designed by Plus Architecture. The ground level podiums contain a commercial precinct with a variety of restaurants and cafes including Italian, Indian, Middle Eastern, Cantonese, Moroccan, Cambodian and Modern Australian cuisines. Yarra's Edge is a residential precinct being developed by Mirvac, and the only Docklands precinct south of the Yarra River. When complete, it will consist of 11 apartment towers, costing A$1.3 billion, and cover 0.15 km2. To date only five apartment towers have been completed, as well as the RekDek (located in the podium of Tower 1 and featuring a gymnasium and 25 metre lap pool), a public promenade, Point Park (with an outlook towards the Melbourne CBD) and a mix of restaurants, cafes and retail, including a day spa and a convenience store. Yarra's Edge also has a 175-berth marina, giving boat owners previously unavailable proximity to Crown Casino and the City. Webb Bridge is an award-winning bridge designed by Denton Corker Marshall, in collaboration with artist Robert Owen, forming a cycling and pedestrian link to the main part of Docklands, through Docklands Park. It is the conversion of the former Webb Bridge rail link. The bridge is near the Charles Grimes Bridge, over the Yarra. Aerial perspective of the District at the Docklands waterfront. March 2019. Waterfront City is a shopping and entertainment area that includes the Melbourne Star Observation wheel, Icehouse ice sports and entertainment centre, and numerous shops and cafes which are centred on this area. The precinct features an integration of retail, waterfront entertainment, tourism, dining, commercial and urban community. It has an area of 193,000 square metres. Stage One was completed in December 2005, in time for the Melbourne stopover of the Volvo Ocean Race in January – February 2006 and the Commonwealth Games in March 2006. 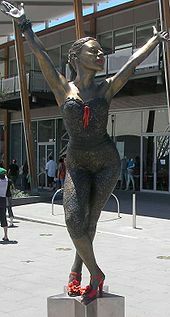 The precinct originally featured a large circus tent, which hosted the International Circus Spectacular, as well as a mosaic of local entertainers and a number of bronze statues, including Kylie Minogue, John Farnham, Graham Kennedy, Nellie Melba and Dame Edna Everage. 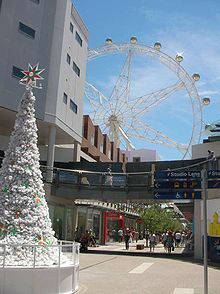 Stage Two includes a public entertainment area incorporating the Melbourne Star (previously Southern Star), a 120-metre (390 ft) tall Ferris wheel in the shape of a seven-pointed star, and the Harbour Town brand direct outlet centre. Harbour Town is home to Australia's first Costco Warehouse Store. Waterfront City also features restaurants, cafes, bars, as well as cinemas, bowling and other family entertainment options. In May 2017 Lord Mayor Robert Doyle and Planning Minister Richard Wynne visited Harbour Town to announce a $150 million redevelopment of the centre including an eight-screen Hoyts cinema, which opened in 2018, and a full-line Woolworths supermarket due mid-2019. During 2017-2018, a collaboration between Harbour Town and Renew Australia allowed the creation of an initiative called the Docklands Art Collective, which made a wing of the Harbour Town complex available at very low rents to arts businesses and galleries. These included a photography studio, a puppetry workshop, a comics retailer and printery, a recycled art paper maker and the relocated Blender Studios. 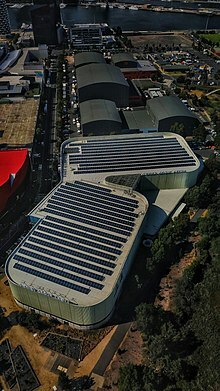 When it opened in 2004, Central City Studios became Melbourne's largest film and television studio complex. The site is located approximately 2 km north west of the Central Business District. It has an area of 60,000 square metres and currently consists of five film and television sound stages. The first major contract for the new studios was the American film Ghost Rider in 2005; with a budget of nearly $120 million, at the time it was the biggest feature film to be made in Victoria and features scenes involving Melbourne landmarks. Since then the studios have housed many international productions. In 2009 the Government of Victoria, together with the Studios, undertook the Future Directions project. This resulted in the State Government committing the Studios to focus on both the international and domestic film and television industries. Further developments to the infrastructure of the site are planned, including a sixth sound stage. On 11 October 2010 the studios were re-branded as Docklands Studios Melbourne, formally adopting the name by which the studios were commonly known. Aerial perspective of the ramp going onto the M2 just outside of the Docklands. March 2019. Docklands has access to road transport, rail transport and water transport. Docklands Highway or Wurundjeri Way is the main road bordering Docklands. Connecting to the nearby Westgate Freeway on the southern end. Links to the Melbourne CBD include extensions from Flinders Street, Collins Street and La Trobe Street. Southern Cross station, near the eastern edge of Docklands http://www.docklandsdirectory.com.au/getting_here, is the closest passenger railway station, it is also the major interchange for metropolitan and intercity rail. Much of Docklands area remains covered by rail yards previously used for freight transport and rolling stock which are being progressively reclaimed or built over. Aerial perspective of the solar system atop O'Briens Group Arena at the Docklands. March 2019. Trams in Docklands include the free City Circle tram, along Docklands Drive and to and from Waterfront City. As Docklands has developed, tram routes have been extended and rerouted into the area. Route 70 also runs to Waterfront City. Route 75 runs along Harbour Esplanade, terminating at Footscray Road. Routes 11 and 48 run along Collins Street to Victoria Harbour. Route 30 enters Docklands via La Trobe Street, terminating at the north end of Harbour Esplanade. Route 86 runs along La Trobe Street and Docklands Drive, terminating at Waterfront City. Docklands also includes major pedestrian links with a concourse extending from Bourke Street and extensive promenades along the waterfront, including the wide Harbour Esplanade. Several offroad bicycle paths run through Docklands, all of which connect through the central spine of Webb Bridge, Docklands Park and Harbour Esplanade, connecting Melbourne City Centre to the inner western suburbs and the Capital City Trail. There are also three ferry terminals which connect Docklands to the Melbourne City Centre and inner bayside suburbs. One at Victoria Harbour, one at New Quay and one at Yarra's Edge. The Melbourne City Council first proposed extending route 86 from Docklands, along Footscray Road to Footscray Station in 2004. The proposal was to be grade separated along almost the entire length of Footscray Road. 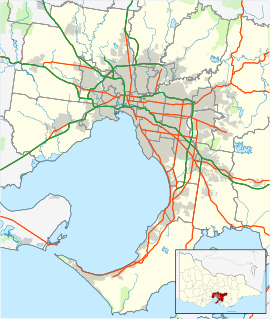 The extension became part of the official Inner Melbourne Action Plan adopted by the Cities of Melbourne, Stonnington, Port Phillip and Yarra in December 2005 as a "long term" goal. Since 2007 plans have progressed, with the City of Melbourne attempting to source funding. In response to the Eddington Plan in July 2008, the City of Melbourne included a request for consideration as a key East-West transport solution. The Victorian Greens also included the route in its 'The People Plan' election proposal. However the proposal suffered a setback in late 2008 when it met State Government opposition. The Department of Infrastructure recommended the removal of the Footscray Road reservation to reduce the cost of constructing an overpass to ease congestion on the CityLink freeway off-ramp. The State Government's plan was rejected by the City of Melbourne, who passed the flyover project on the provision that it would retain the light-rail reservation, at additional State Government expense, whilst also adding to the future cost of the tram link. In the 2016 Census, there were 10,964 people in Docklands. 27.3% of people were born in Australia. The most common countries of birth were China 16.5%, India 12.7%, South Korea 3.1%, Malaysia 2.6% and England 2.3%. 34.4% of people only spoke English at home. Other languages spoken at home included Mandarin 18.3%, Hindi 4.9%, Cantonese 3.1%, Korean 2.9% and Telugu 2.4%. The most common response for religion in Docklands (State Suburbs) was No Religion at 38.1%. Of the occupied private dwellings in Docklands, 97.1% were flats or apartments and 2.3% were semi-detached, row or terrace houses, townhouses etc. In 2009, there were just under 10,000 working mostly in office and retail industries. The precinct has two publications, Docklands Community News (DCN) and 3008 Docklands Magazine. The Docklands Community News' first edition was published in 2003, and both DCN & 3008 Docklands Magazine have grown with the Docklands precincts' population. Both publications are printed and distributed to all businesses and residences within Docklands, which allows for a regular readership of over 10,000. The DCN paper informs the community of relevant news relating to Docklands as well as supplying residents, business owners and workers with a platform for community discussion. 3008 Docklands Magazine also covers all matters relating to the Docklands community and businesses, but also covers events and news pertaining to Melbourne City and the surrounding suburbs, as Docklands is under the jurisdiction of the City of Melbourne. 3008 Docklands Magazine is a glossy, well produced, stylish publication which is both informative and interesting and has been well received by its reader base since its first issue back in May 2006. 3008 Docklands Magazine has a significant online following. The planning of Docklands has raised a large amount of public debate and the area has created significant controversy, particularly the failed Ferris wheel. 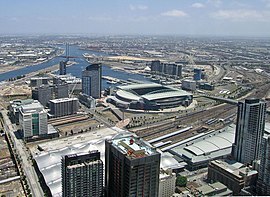 In 1999, Melbourne City Council Director of Projects criticised the disconnection of the precinct to the CBD, claiming that the lack of transport links, particularly pedestrian, meant Docklands was "seriously flawed". The problem was exacerbated in 2005, when the pedestrian link between Lonsdale Street and Docklands proposed in 2001 was cut from the final design of the Southern Cross Station development due to budget blowouts. In 2006, Royce Millar of The Age referred to it as a "wasted opportunity". In 2008, the City of Melbourne released a report which criticised Docklands' lack of transport and wind tunnel effect, lack of green spaces and community facilities. In 2009, Neil Mitchell wrote for The Age declaring Docklands as a planning "dud". The Lord Mayor, Robert Doyle, has been openly critical of Docklands, claiming in 2009 that it lacks any form of "social glue". However, despite the local criticism, in 2009, Sydney travel writer Mal Chenu described Melbourne Docklands as "the envy of Sydneysiders". In 2010, VicUrban's general manager David Young acknowledged that Harbour Esplanade "doesn't stack up". Kim Dovey, professor of architecture and design at the University of Melbourne, added that Harbour Esplanade was "too big" and claimed that Docklands was "so badly done" that it required a "major rethink". The Docklands area has come under heavy criticism for the failure to provide a school with families being forced out of the area or needing to commute to state schools already under pressure from the critical shortage of schools in the inner suburbs. A private school, Melbourne City School, opened on King Street in 2010 but closed in 2012 due to low enrollments. George Savvides, CEO of Medibank, which has been based in Docklands since 2004, has been critical of the area’s lack of soul and amenity, but the company has nevertheless chosen to remain committed to the area. A panoramic view of Docklands and the city skyline from Waterfront City looking across Victoria Harbour Features include (from left), some residential and commercial buildings along the harbour at New Quay, the Seven Network digital broadcast centre, some of the original (now renovated) Melbourne docks sheds on Central Pier, the Docklands Stadium, the Victoria Point apartments, and the colourful lowrise National Australia Bank headquarters. In the background is the Melbourne CBD skyline, including the Rialto Towers and the Eureka Tower. The construction in progress of some buildings in Docklands shows the still evolving nature of this part of the city. ^ a b c Australian Bureau of Statistics (27 June 2017). "Docklands (State Suburb)". 2016 Census QuickStats. Retrieved 23 August 2017. ^ a b Tomazin, Farrah; Donovan, Patrick; Mundell, Meg (7 December 2002). "Dance trance". Age. Fairfax. Archived from the original on 13 May 2017. ^ Draper, Michelle (28 September 2006). "ANZ deal sparks Docklands concern". Age. Fairfax. Archived from the original on 14 March 2009. Retrieved 18 December 2010. ^ Johnston, Matt (3 September 2009). "Docklands to get more parkland, 1000 more homes in $1b project". Herald Sun. News Limited. Archived from the original on 5 September 2009. Retrieved 18 December 2010. ^ a b Millar, Royce (17 June 2006). "Docklands a wasted opportunity?". Age. Fairfax. Archived from the original on 29 September 2008. ^ a b "dead link". Herald Sun. News Limited. Archived from the original on 28 March 2009. ^ a b Dowling, Jason; Lahey, Kate (16 March 2009). "Doyle call for council to take on Docklands". Age. Fairfax. Archived from the original on 29 May 2009. ^ a b c d e f g Dovey, Kim (2005). Fluid City: Transforming Melbourne's Waterfront. Sydney: University of New South Wales Press. ^ "Fox Classic Car Museum". www.foxcollection.org.au. Archived from the original on 15 March 2018. Retrieved 4 May 2018. ^ Millar, Royce (2 August 2007). "Visionary architect set to transform Docklands". Age. Fairfax. Archived from the original on 7 February 2011. Retrieved 18 December 2010. ^ Craig, Natalie (13 December 2007). "New Age building revealed". Age. Fairfax. Archived from the original on 16 December 2007. ^ Victoria, Development (29 March 2017). "Home". www.docklands.com. Archived from the original on 7 February 2012. Retrieved 4 May 2018. ^ Victoria, Development (29 March 2017). "Home". www.docklands.com.au. Archived from the original on 3 April 2012. Retrieved 4 May 2018. ^ Liu, Sunny. "New reasons to visit Harbour Town". Docklands News. Archived from the original on 28 March 2018. Retrieved 5 June 2017. ^ Monday, Posted on; June 19; 2017 (19 June 2017). "The Docklands Art Collective – Rent-Free Space For Creatives!". Renew Australia. Retrieved 28 January 2019. ^ "Docklands Art Collective". Renew Australia. Retrieved 28 January 2019. ^ Lucas, Clay (2 January 2008). "Vision for 'friendlier' Docklands". The Age. Archived from the original on 3 April 2009. Retrieved 19 July 2008. ^ Victoria, Development (29 March 2017). "Home" (PDF). www.docklands.com. Archived (PDF) from the original on 22 February 2012. Retrieved 4 May 2018. ^ "PM - Melbourne's 'big wheel' already drawing criticism". www.abc.net.au. Archived from the original on 12 May 2017. Retrieved 4 May 2018. ^ "The World Today Archive - Docklands looks to the future". www.abc.net.au. Archived from the original on 19 October 2015. Retrieved 4 May 2018. ^ Lucas, Clay (2 January 2008). "Vision for 'friendlier' Docklands". Age. Fairfax. Archived from the original on 4 November 2012. Retrieved 18 December 2010. ^ Chenu, Mal (6 August 2009). "Cows, cranes and goalposts". Sydney Morning Herald. Fairfax. Archived from the original on 4 November 2012. Retrieved 18 December 2010. ^ a b Cooke, Dewi (17 March 2010). "Docklands $9bn plan for next decade". Age. Fairfax. Archived from the original on 4 February 2011. Retrieved 18 December 2010. ^ Kinkade, Alison (30 April 2010). ""We are not happy" - Docklands families want a school". Docklands News. Archived from the original on 31 May 2012. ^ Craig, Natalie (13 June 2010). "Critical shortages in inner-city schools as population swells". The Age. Archived from the original on 13 December 2011. ^ Price, Nic (11 February 2013). "Residents in inner Melbourne's newest suburbs, the Docklands and Southbank, renew calls for a new school". ^ Dowling, Jason (27 September 2011). "Lack of 'soul' has Docklands tenant ready to leave". The Age. Archived from the original on 4 May 2018. Retrieved 4 May 2018. ^ Scanlan, Shane. "Medibank to stay in Docklands - Docklands News". www.docklandsnews.com.au. Archived from the original on 18 April 2018. Retrieved 4 May 2018. ^ Dowling, Jason (3 July 2012). "Docklands critic has designs on a new cityscape". The Age. Archived from the original on 4 May 2018. Retrieved 4 May 2018. Wikimedia Commons has media related to Docklands, Victoria.